You could go for the first three captured B-29's that crash landed on Russian soil. That way you wouldn't need to change the engines. On the propeller front a light sanding to get rid of the flash will do. 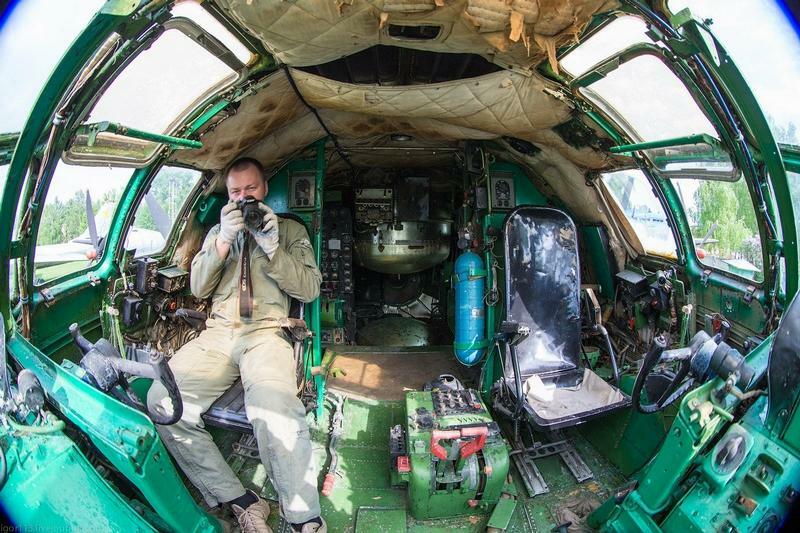 Bog-standard interior green, throughout the inside fuselage halves and cockpit. As for the wings try as I do I can never get them level. No matter how many paint tins I slide under them one is always lower than the other. Alternative approach is some sort rig.I suggested the gluing the wings to the fuselage halves as a natural fit at 90°. If you want them to droop put coins in the wing tips. Coins are a good ballast. On Google search under; internationalscalemodeler , B-29. There's some very good pics (it's the Academy kit), but the interior pics are a very good source of reference. Outstanding! Thank you. Hard to go wrong with such help. Most of the interior is painted. All of the crew is painted; green flight suits, white helmets, brown gloves, black boots, white shoulder patch, face mask left the "silver" color of the styrene. Walls painted the glorious Soviet blue color they love and the floors painted green (per pictures of an actual Tu-4) and the seats painted black. Uh oh... just realized I lost both of the yokes... .. uhh.... **looks around**** ... . . . found one on the floor.. OK.... **looks around***** . . . . . well crap! I guess after this update I'll be with the flashlight and down on the floor. Thankfully I vacuumed yesterday so not much "stuff" on the floor to throw me off, if it even IS on the floor! I noticed the egregious lack of a bomb sight so I figured I'd scratch one up real fast.. but uhhhh... where the hell do I put it?! Looking at this thing the bombardier sits literally at the very forward edge of the fuselage.... when I put the nose piece on there would be no room! 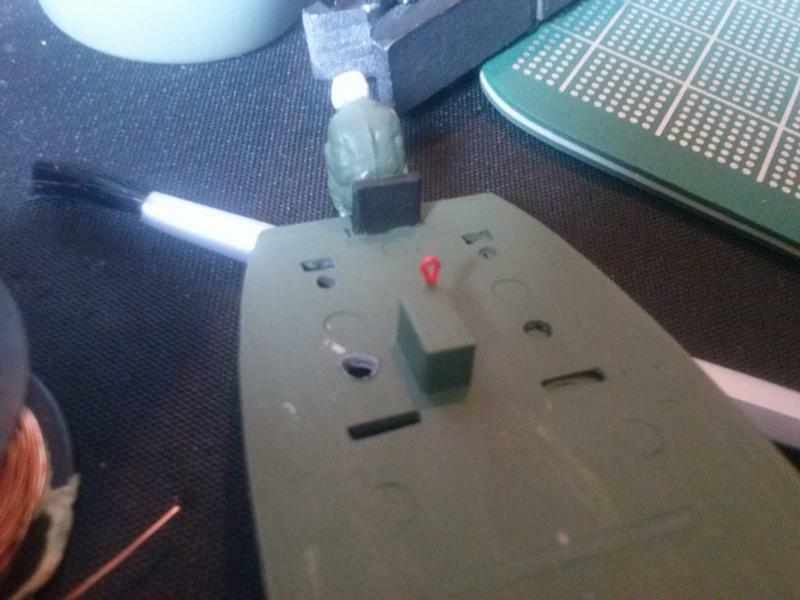 I'll have to get the clear nose piece and do some dry fitting to see if I can come up with a solution. Anyway, time to look for this missing yoke..
EDIT: OH YES!! I found it!!!! 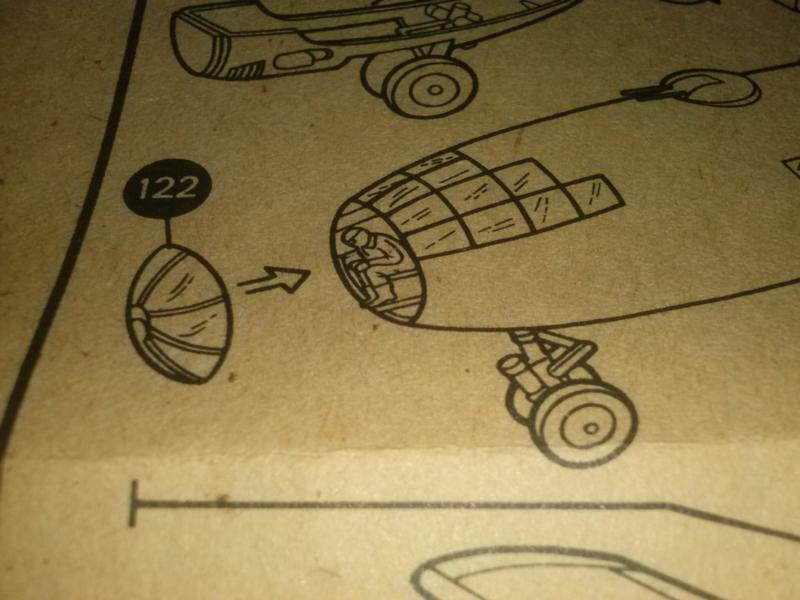 You will have to cut one of the flight crews' legs off so that the nose glazing fits. A few charts will look good in the cockpit made from scrap plastic. Hey... that sounds doable. 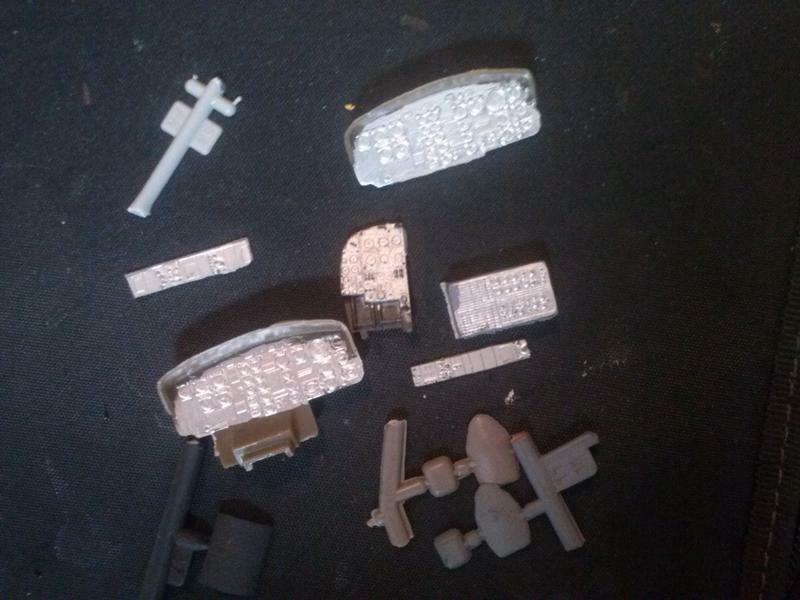 I have some of the thin pieces from sprues that have the parts numbers on them. I could chop some down for the charts. I'm having a blast with the glorious pictures I found (I edited the opening post of this thread with this and other links) here: http://englishrussia.com/2013/05/23/the-only-tu-4-plane-russia-has-today/4/ Some 30 odd pages of pictures. Says one has to be a member to get them all on one page... oh well, I don't mind clicking a bit. 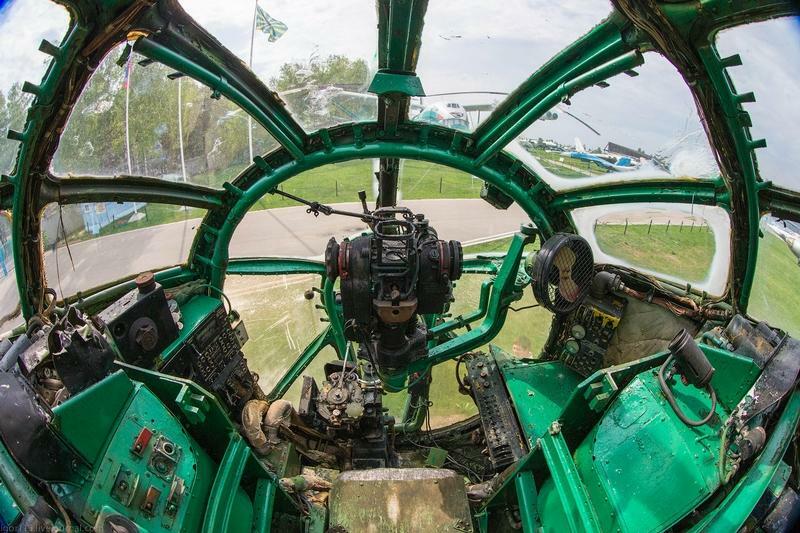 But anyway, holy crap look at all the stuff in there (cockpit and adjacent areas)! But anyway... I have good reference to scratch some stuff up to improve this interior. The problem lies in where I draw the line. I damn sure want my bomb sight, the charts sound glorious, and I could potentially jam some tiny wires in there and even paint certain details onto the walls, etc. I know the ceiling area (and possibly more) was draped with some light colored insulation looking stuff so I'm going to at least paint some type of off-white to represent that. (hence the upper sections of the fuse halves un painted in the cockpit areas). Anyway.. damn, this is fun. You could build it as Fidel's VIP aircraft? Back at it today I suppose. Plans include gathering up the next round of parts to be worked on, check them off the instructions, and place them into a bag. 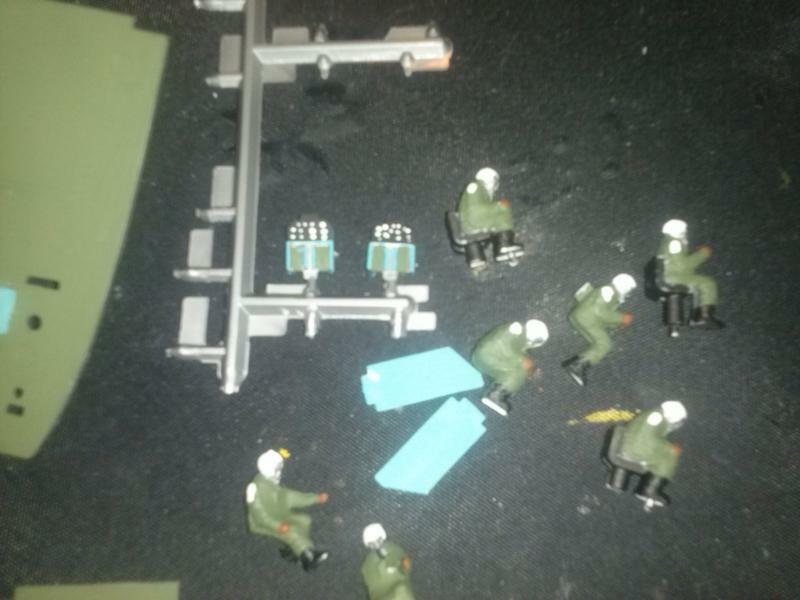 I also found some sprue leftover to cut some things off to make the placards and charts and whatever else. I also plan to get back to my interior pictures to see what else I could try to simulate. 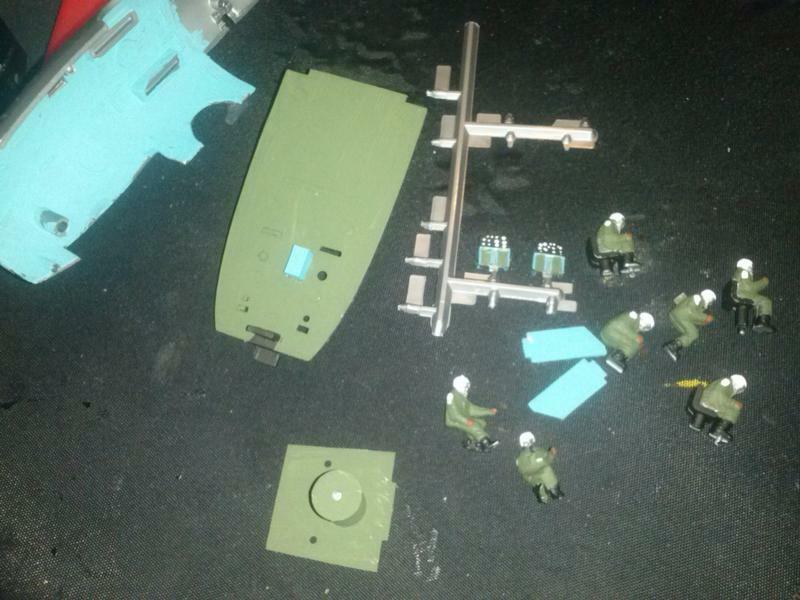 I also plan to get out the nose piece and I'm going to dry fit to see how much of ol' boys feet has to get chopped off and to see where and how I can attach the bomb sight. Went on a scavenger hunt because it hit me that I had some panels and such in my meager spares dept. Looking at my pictures there's all kinds of stuff crammed in that cockpit including dials and guages on either side of the bombardier station. I believe I can add that stuff in and some other things. There's also a box on the floor between the pilots' seats that has... I dunno.. the throttles But there are only two? Bomb bay doors? Gear or something? What is it??? Anyway... there are two red handles on there I'd like to build. (I need to repaint this box, as well, as I used the wrong color). Also, see the O2 tank back there? I'd like to make that! Should be pretty easy. I might have the odd piece of junk laying around that will do. Also, I'm thinking about finding a piece of spare cloth to put inside as insulation... hell, why not?! Going to all the other trouble so may as well do it, too! My luck I'll somehow completely fog over the clear pieces and won't be able to see any of this crap. A layer of filler scored in a diamond pattern would work or sections of foil. I'd like to try the foil. I just realized it would be a pain to try to put a single piece of cloth in there. And I guess it just wouldn't look right, either now would it? Great tip, thanks! I formed the handles on that box around the wee very end of a tooth pick then painted the lower section green and top section red. I decided not to try to cut them apart from each other... might so something I don't want.. this is good enough for peering through the windows! I'm going to try the bomb sight now. I checked the fitment of everything and it's good so far, but tight.. I'm not sure if I can fit anything between the clear piece and my bombardier. I may have to saw on his legs or something to open up a tiny bit of a groove or something. What good is a bomber with no bomb sight?! Oh nice! The problem sort of solved itself. 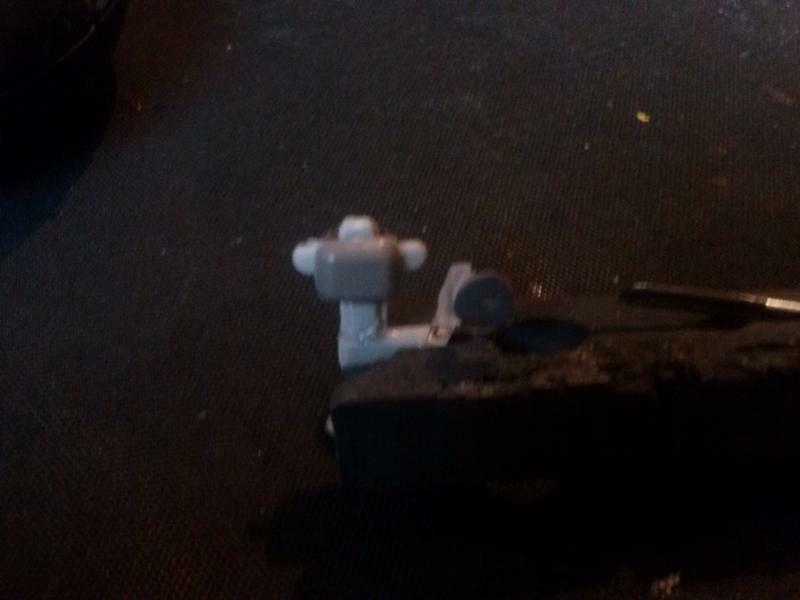 The sight didn't attach to the floor, it attached to the side. I made it but I think I'm going to have to move the fan in a little bit. I'll do that then paint it then glue it to the inside of the nose piece.